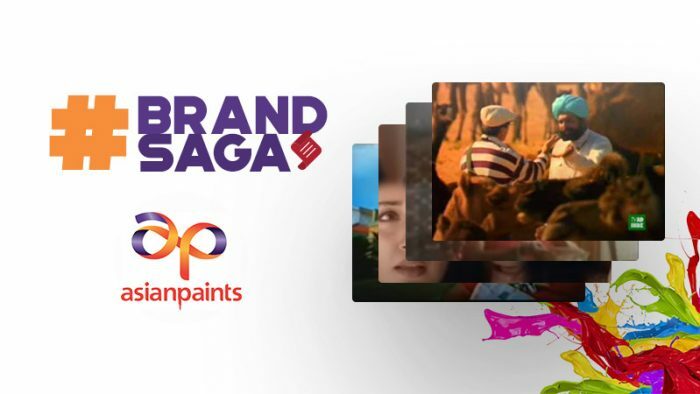 This week dive into the brand saga of Asian Paints’ advertising journey and take a tour of its ubiquitous and futuristic empire that has revolutionized the otherwise touted to be a ‘dull’ category like paints. One of my guilty pleasures has always been smelling paints and old books. While books have been a personal favorite and are preserved for ages, it’s the chemical compounds in the paint that make it almost addictive. Asian Paints has been enjoying such kind of fan following since decades. The 73-year-old brand has become synonymous with the category humanizing the concept of home for all of us that it wouldn’t be wrong to call it a family brand. Asian Paints saw the light of the day when the firangis had still not backed off in 1942 and continued ruling India. Amidst fierce freedom fights, four friends- Champaklal Choksey, Chimanlal Choksi, Suryakant Dani and Arvind Vakil came together to start the company at a garage in Mumbai’s Girgaum area. Post a temporary ban on paint imports in 1942, a small entrepreneurial venture then- Asian Paints fought for sustenance against foreign giants and Shalimar Paints and eventually went onto become the market leader in 1967 across the country. ‘Don’t lose your temper, use Tractor Distemper’ flashed the print and outdoor advertisements in early 50s when the brand launched it’s washable distemper range ‘Tractor Distemper’ which was a strategic product launch and was a balance between the cheap dry distemper that peeled easily and the more expensive plastic emulsions. The advertising then conveyed the message loud and clear. Definitely, the highly revered brand mascot of its times, ‘Gattu’ an iconic creation by a legendary RK Laxman aided Asian Paints brand recall for many years. 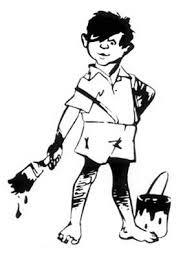 In 1954, Gattu- a mischievous boy with a paint bucket in his hand – was launched and found its fan base in India’s middle-class population. Gattu helped in bringing the commodity-led business of painters to the actual end users of home-owners. At a time when paints were merely advertised as industrial products, Asian Paints aimed at reaching every house and become a user consumer-friendly personality. It reached out to cartoonist RK Laxman for creating a character that can resonate with the masses. 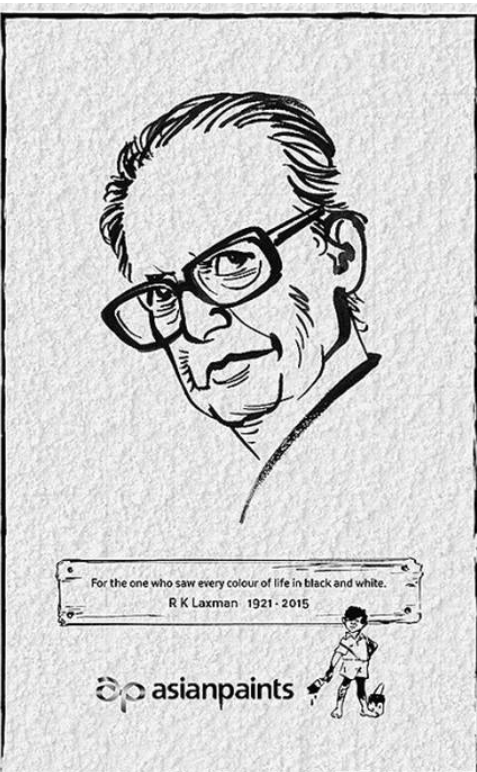 “Asian Paints was struggling for an idea”, an ET blog quoted RK Laxman. And chain smoking for inspiration, when, gradually through the fumes of cigarette smoke, he saw the image of a little boy with a paint-brush take shape. And that, in his own picturesque words, was how the famous mascot was born. Further revealing the story behind the name game of the mascot, the late cartoonist recalled that the next question for Asian Paints was what to call him and subsequently a contest ‘Give Me a Name’ was run offering a prize of Rs 500 for the best name. 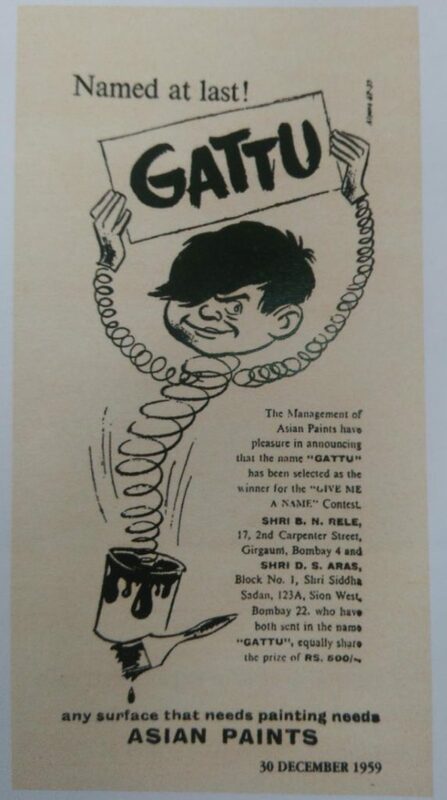 Soon mischievous Gattu, with his ‘shock of black hair eternally dangling over his right eye’, became popular and the company sales increased tenfold. He was used only in print advertisements and packaging till the 1970s and by 1990s was also seen on television advertisements until 2002 when he was sadly axed. In the early nineties, black and white ruled the market while colors and paints were far fetched choices. Consumers were not used to taking a decision for which color to adorn their house walls. Cut to Asian Paints rolling out ‘Mera Wala Blue’ campaign where a couple on a road trip in the desserts fo Rajasthan chase the blue color turbaned man to paint her ‘ghar ki deewar’ with the same color. The tagline became so popular that people would go to the hardware shops and ask for ‘Mera Wala Blue/Cream’. Ad guru Ambi Parameswaran in his book, Nawabs, Nudes, Noodles: India through 50 years of advertising revealed that Asian Paints had soon started challenging the dominance of brands like Johnson and Nocholson and ICI’s Dulux. In 1990s they caught the imagination of the country with an ad that a young man returning home as his mother is preparing food. The director of the film Rajiv Menon who later made some wonderful Tamil movies used to Tamil festival Pongal to build a great look for the film. With the campaign, Asian Paints was successful in shifting the consumers’ focus from letting the hardware shop decide the color for you to the consumer taking the decision making in their own hands. This marked the beginning of an unbreakable bond between the advertising agency Ogilvy & Mather and Asian Paints, the collaboration which went onto to deliver advertisements that revolutionized the paint industry. The series went onto build a distinct identity of the brand. After RK Laxman stopped drawing the cartoon, Asian Paints and Ogilvy joined hands to launch a new marketing strategy by focusing on festive occasions with their tag line “Har Ghar Kuch Kehta Hain“ (Every home says something about its owner). The consumers were now looking for more and a change. Ogilvy’s creative minds with the brand team banked on festivals like Diwali and Pongal, occasions like childbirth and marriages to take the iconic ‘Gattu’s familiarity and brand image to the next level. The insight was an instant hit and thus was born the ad campaign for ‘Har Ghar Kuch Kehta Hai’ proposition. The company advertised it as an occasion to paint homes by connecting on an emotional level. During this time, the campaigns were more focused on the home exteriors focusing on how the paints could keep the exteriors timeless. The very first Har Ghar Kuch Kehta Hai ad was narrated by ad veteran Piyush Pandey. This was the first time when the brand went focused on what it take to build a beautiful home foraying into the home decor space. The tagline reflected the pride one takes in showcasing a pretty and vibrant home defining the 21st-century personalities. Ogilvy & Mather has been associated with Asian Paints for the last 33 years. For Sukesh Nayak, Chief Creative Officer at Ogilvy, Asian Paints is a brand that is human. A brand that connects with the audience in a language that is simple, relatable and heartwarming. The iconic Wah Sunil Babu Wah ad hit the right notes with the consumers with its dash of humor where a neighbour is impressed by Sunil babu’s new house, car and svelte wife. The Indian idioms like ‘Har Ghar…’ and Badiya Hai were inculcated in the communication to relate to the masses and make them feel a part of it. The ad showed that even after one year while the car has turned junk and the wife has put on some weight, the house remains as fresh and beautiful as it was. The TVC was applauded by lots and was directed by Prasoon Joshi who wears many hats and helmed creative team at Ogilvy then. In the later years, catching hold of the changing times and consumer’s decision making power, the brand took a decision to transform from being a simple paint can company to being a solution provider. It went onto launch it’s ‘Home Solutions’ where Asian Paints started painting services through a dial-in facility. Meanwhile also launching a new marketing stint with the introduction of a one-stop Colour shop for paints complete with software for consumers to choose and select their different shade combinations. Going with the modern day lingo, Ogilvy and Asian Paints created another set of campaigns ‘‘Nahi Bhaiya’ to match the contemporary vibes while already amassing a huge consumer base. 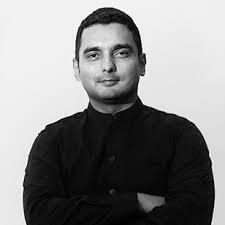 Rohan Mehta, CEO, Social Kinnect asserted that Asian Paints is synonymous with elevated interior decor, and has always been more than just a paint brand in India. This brand image is, in part, due to its marketing and campaigns that go beyond simple paint ads. “With the launch of several initiatives like Delhi Beautiful Homes (The first ever ‘beauty contest for homes’) and the ‘Rethink Recycle’ campaign, Asian Paints is reaching out to its consumers in a way that engages them directly and makes them think, whether that means discovering new ways to style their home or even reuse and recycle paint cans,” he shared. It was time for Asian Paints to move to a more premium appeal for higher business appeals. It underwent two rebranding activities. The first put the emphasis on a corporate identity in the early 00s which also put the emphasis on a more corporate identity while the second saw Asian Paints logo shortened to AP. The logo/design was to convey self-expression, sophistication and technology. According to reports, since then, AP, rejigged its brand portfolio and kept the emphasis on a few strong brands, neatly clubbed under verticals like exterior (Apex Ultima), interior (Tractor Emulsion, Royale, Royale Play), solutions (Ezycolour) and waterproofing (SmartCare) releasing campaigns accordingly by roping in celebrities like Soha Ali Khan, Saif Ali Khan, Deepika Padukone and Ranbir Kapoor who have made the recall a bit too high for Asian Paints. Contract advertising has also played a pivotal role in Asian Paints beautiful journey so far by creating campaigns for the brand keeping in mind it’s vision for the product which it aims to sell with out-of-the-box storytelling. A perfect example being the 2017 TVC featuring Deepika Padukone which looked no less than a crime thriller. It promoted Asian Paints Royale Atmos is a first of its kind product which will not only beautify the home but also will fight indoor air pollution. Asian Paints has been a pro in making an optimum utilisation of Youtube as a social communicating platform since the early days of Internet penetaration in the country. 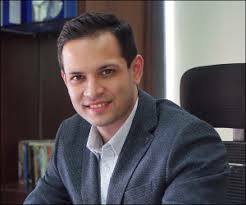 To no surprise the communication has been so effective that the videos have managed to garnered thousands and lakhs of views on the platfomr which were also cross promoted via Facebook and Twitter. 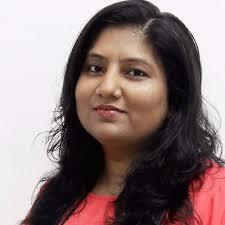 From urging people to go green to weaving three minute ad films on making men understand colours to making thought provoking and beautiful storytelling such as ‘Homes Not Showroom’ to foraying into the original content space with seasons of Har Ghar Kuch Kehta Hia series, Asian Paints Colour Journey , #MakeRoomforNEU contest , Asian Paints Where the Heart is, PeopleAddColour, Asian Paints has been a pioneer in adopting the digital route and acing the social game like a pro. In the early 2000s, with the burgeoning popularity of soap operas, Asian Paints cleverly inserted its colours into the sets for these shows, increasing their offtake. The most recent foray for the company is around #Homesnotshowrooms which makes a case for people to relax and let go in their perfectly interior-designed residences. According to a google case study, Asian Paints used a YouTube-first strategy to strengthen its relationship with current customers already familiar with its paint products, and to attract a wider audience interested in do-it-yourself projects and home decor. The company that popularized the tagline “Har Ghar Kuch Kehta hai” (“Every home says something about its owner”), Asian Paints wanted to create an emotional connection with people through inspiring long-form video content. To do so, the brand targeted YouTube viewers specifically interested in home decor as a hobby with a series of seven online videos featuring Indian celebrities in their homes. Featuring stars like actress Radhika Apte and legendary cricket player Sourav Ganguly, Asian Paints’ “Where the Heart Is” campaign gave audiences the opportunity to find design inspiration by touring celebrity homes on YouTube. To ensure continued engagement throughout the campaign, the company spread out the publication of each video. Throughout the campaign, Asian Paints generated more than 40 million views (22% from organic traffic). Additionally, the company’s channel gained an additional 39,500 subscribers (comprising 22% of its total lifetime subscribers). Overall, Asian Paints experienced a brand lift increase of 20%. “Asian Paints’ social relevance in India doesn’t stop at encouraging its consumers to recycle,” quoted Mehta. With its recent and ongoing ‘Donate A Wall’ campaign, the brand is making over public spaces in Indian cities through the magic and beauty of paint, one wall at a time. As consumers are getting their conscious and expecting their brands to be the same, Asian Paints truly encapsulates the spirit of the time. 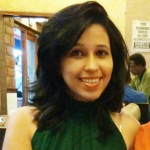 According to Mitchelle Carvalho, CEO CogMat Asian Paints has had many memorable campaigns and every mainstream celebrity worth her/his salt has been part of the brand journey at some stage, however the ad that had the greatest impact on her as a consumer was, the “Sunil Babu… badhiya hai” ad. “It was simple, effective and effortlessly funny. The brand, over the years, has experimented with various emotions from sappy to happy but somehow Sunil Babu’s untainted bungalow while the world goes by is the fondest memory most of us will have of Asian Paints,” shared Carvalho. Over the years Asian Paints has been making our house happier and takes pride in amalgamating innovation and technology with it’s product development programme, marketing gimmicks customer service going beyond walls and being Indian at heart, hamesha.